A private social network that is designed to cater to businesses, Workplace by Facebook is a spitting image of the social media platform. It sports tools that are very similar to those of Facebook, and they can be used to join groups, share information, and organize events, among others. The app’s most notable attribute is its function as a team communication and messaging tool. For employees, the platform can be used to create profiles, connect with others through instant messaging, make groups for individuals who share interests with one another or those who come from common departments. For companies, on the other hand, the application serves as a central communication hub from which both staff and managers can send volumes of messages using more advanced solutions. Events can likewise be scheduled, with videos recorded or live streamed, which is very useful for corporate presentations. One of the best things about Workplace by Facebook is that it is relatively inexpensive so that even small businesses can take advantage of its many features. Workplace by Facebook takes conversation to a whole new level, allowing anyone to communicate with the entire organization. This results in better conversations and knowledge sharing, avoiding corporate silos. It also opens channels for feedback through comments, reactions, and likes. The platform is designed to focus on people in organizations by promoting diversity and feedback as means to engage staff and support cultural change. You can measure employee opinions by running polls and develop deeper relationships with staff by recognizing them in news feeds with a GIF or reactions. Workplace by Facebook, unlike most collaboration apps, gets even better as users increase. This it does by mixing instant messaging functionalities with group discussions. Its Workplace Chat provides real-time responses while more relevant conversations result from the use of project groups. As the platform comes with features that are familiar to most individuals, many prefer to use it. Its ability to integrate with current systems improves employees’ use of tools that are already in place. These are done with one-click provisioning, single sign on, and the integration directory that comes with the system. What Problems Will Workplace by Facebook Solve? Workplace by Facebook is a tool that can very well resolve problems that are inherent in corporate communication. 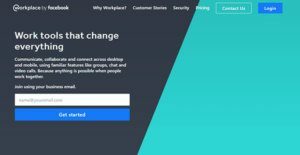 This social network platform for businesses hosts numerous features, that used correctly, can help companies get rid of some of the most common communication headaches. The software’s Workplace Chat can effectively solve complications arising from communication with staff that are on the go. It can link anyone to everyone at any given time or place. The tool’s emojis, GIFs, thumbs up, and stickers can instantly connect people wherever they may be. The platform has a Workplace Groups feature which allows users to create private spaces where projects can be discussed. They can also serve as a safe channel through which documents can be shared securely. Users can create as many groups as are required, all with unlimited storage and secure file sharing capability. As Workplace by Facebook can integrate with most existing systems, a central hub from which everything can be managed is created. This results in accelerated task management, simplified processes, and improved sharing. Users can set up bots to send out notifications both through chats and groups. Workplace by Facebook integrates smoothly with G Suite, Salesforce, Office 365, Dropbox, SurveyMonkey, and other leading business applications. There are well-liked and widely used applications in each software group. But are they essentially the best fit for your company’s special requirements? A popular software solution may have thousands of users, but does it provide what you need? For this reason, do not blindly shell out for popular systems. Read at least a few Workplace by Facebook reviews and mull over the aspects that you desire in the software such as the fees, main features, available integrations etc. Then, choose a few systems that fit your needs. Try out the free trials of these platforms, read online comments, get explanations from the maker, and do your research thoroughly. This in-depth homework is sure to aid you find the best software solution for your company’s special requirements. How Much Does Workplace by Facebook Cost? Workplace by Facebook offers two distinct pricing plans. Here are the details. We realize that when you make a decision to buy Collaboration Software it’s important not only to see how experts evaluate it in their reviews, but also to find out if the real people and companies that buy it are actually satisfied with the product. That’s why we’ve created our behavior-based Customer Satisfaction Algorithm™ that gathers customer reviews, comments and Workplace by Facebook reviews across a wide range of social media sites. The data is then presented in an easy to digest form showing how many people had positive and negative experience with Workplace by Facebook. With that information at hand you should be equipped to make an informed buying decision that you won’t regret. What are Workplace by Facebook pricing details? What integrations are available for Workplace by Facebook? If you need more information about Workplace by Facebook or you simply have a question let us know what you need and we’ll forward your request directly to the vendor.